The ruins of the ancient church at Kilcoole are most often known after the name of St Comgall (Chomhghaill). The monks of St Comgall in County Down were known to have established a number of religious settlements along the Irish sea, however there are many St Comgalls in Irish history and this association is not certain. Others sources state that the old church was associated with a St Lughaidh, venerated on 9th March. The present structure is Anglo-Norman and said to date from the 12th century. The church was described by Archbishop Alen in 1530 as the parish church, with four outlying chapels at Kilfernock, Kilpedder, Kilpatrick, and Ballygannon. 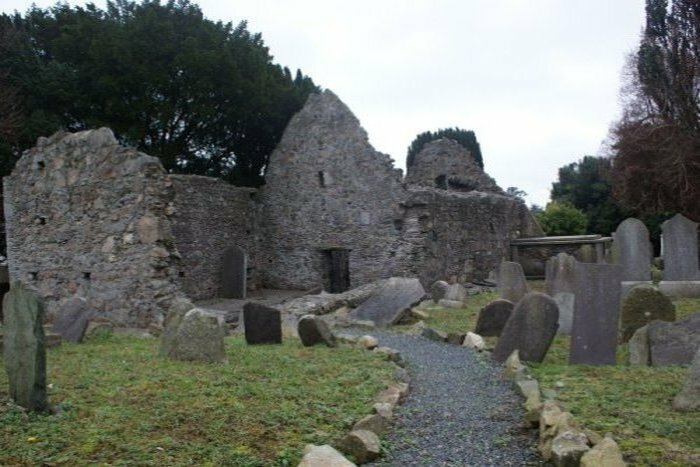 The Archbishop Bulkeley of Dublin wrote in 1630 that “the Church and Chancel of Kilcoole are both in great decay and altogether unfurnished”. At some point the parish seat moved to nearby Kilquade. By the 1890s the grave yard was still in use but not well maintained. This church is very unusual in having three compartments. As well as the nave and chancel, there is an atrium or ante-chamber at the west end of the nave. Just inside the nave is an old Font on a rough stone pedestal and, near the chancel, a very irregularly shaped granite slab having a crude cross with narrow rounded shaft and arms carved on it. About 7 feet from the ground the walls of the nave curve upwards, which may indicate a stone roof. The earliest graves here date from the early 1700s, with the last burial in the 1930s. Some grave markers are works of art, such as that of Robert McCormick who died in 1784. It was created by the renowned sculptor Dennis Cullen of Monaseed in Wexford and is carved with intricate detail. The Byrne/Scott family of Ballygannon are interred here within the chancel. To the northeast of the church was a holy well known as Rakes Well, after which the present-day estate of Wellfield is named. If the gate is locked, check with the neighbour for a key.